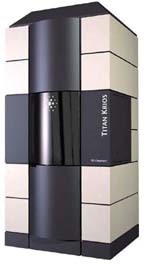 The Titan Krios has an XFEG electron source and operates at 300kV. This microscope not only has a 4k x x4k CCD, but also a new Falcon II direct electron detector camera which avoids loss of data quality which can occur with other detectors and is more sensitive. This detector effectively increases resolution by recording sharper images and compensating for sample movement while it is imaged. It has been designed to be extremely stable by environmentally isolating the system from external vibrations and temperature changes. Thus grids are robotically transferred into the beam and the user operates the instrument from a separate room. The improved system provides superior controllability and reproducibility, and the ability to collect data on a single grid for up to a week. Traditionally, EM grids have to be changed manually every 4-6 hours. Ten sample grids can be loaded. For suitable specimens, computational analysis of images from the Krios with a direct detector generates atomic models that rival those calculated by X-ray crystallography and NMR spectroscopy.